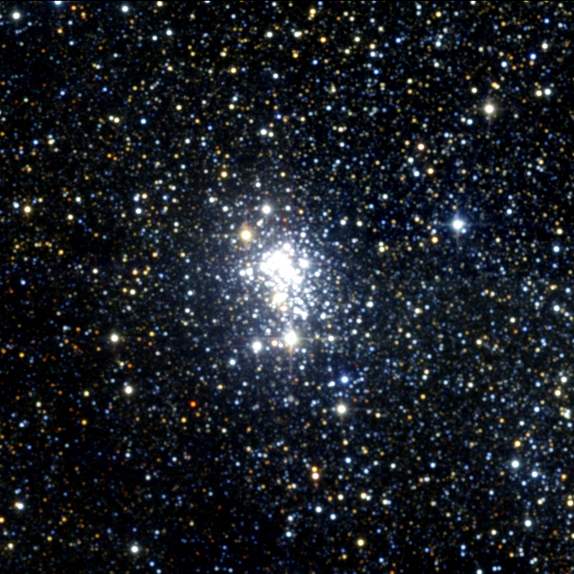 The optical image (left) of Westerlund 1 shows a dense cluster of young stars, several with masses of about 40 suns. Some astronomers speculated that repeated collisions between such massive stars in the cluster might have led to formation of an intermediate-mass black hole, more massive than 100 suns. A search of the cluster with Chandra (right) found no evidence for this type of black hole. Instead they found a neutron star (CXO J164710.2-455216), a discovery which may severely limit the range of stellar masses that lead to the formation of stellar black holes. The neutron star - a dense whirling ball of neutrons about 12 miles in diameter - revealed itself through periodic X-ray pulsations (every 10.6 seconds). A neutron star is left behind after a massive star completes its evolution and goes supernova. Since extremely massive stars evolve more rapidly than less massive ones, and the progenitor of the neutron star has already exploded as a supernova, its mass must have been greater than 40 solar masses. If such massive stars produce neutron stars, what types of stars produce stellar black holes? Theoretical calculations indicate that extremely massive stars blow off mass so effectively during their lives that they leave neutron stars when they go supernova. The discovery of the neutron star in Westerlund 1 leaves a small window of initial masses - between about 25 and somewhat less than 40 solar masses - for the formation of black holes from the evolution of single massive stars. Other factors, such as the star's chemical composition, its rotation rate, or whether it is part of a double star system, may play a role in determining whether a massive star leaves behind a neutron star or a black hole. Further searches of young star clusters are needed to solve the mystery of how stellar black holes are produced. Scale Image is 300 by 270 arcsec . Coordinates (J2000) RA 16h 47m 05.40s | Dec -45º 50' 36.70"